Slightly bulkier than Common Swift with broader, less tapering outerwing and sometimes blunter wing-tips; tail-fork variable but slightly shallower with less pointed tips; head looks broad and flat with larger, more triangular, whitish throat-patch; forehead and lores paler, contrasting with dark eye-patch. 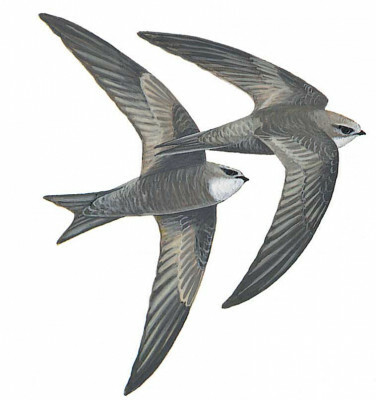 Overall colour brownish; with good views rather distinct scaling is visible in underparts (uniform in Common Swift); upperparts show darker ‘saddle’ slightly contrasting with paler inner flight-feathers, head and rump. Underwing shows darker outer primaries than innerwing, the latter not contrasting markedly with wing-coverts or body as in Common Swift. Much of colour tone variable, depending on light conditions and wear and can be difficult to separate from Common Swift unless seen well.